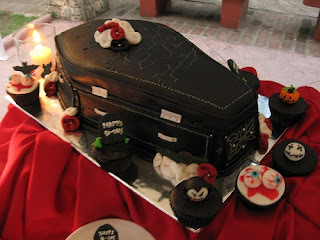 The Spooky Vegan: It's My Birthday and I'll Blog If I Want To! Yes, it's my birthday (*squeeeeeeeeeeeeeeeeeeeee! *), so that means I get to do what I want, when I want! Which probably means lounging in my PJ's all day and sending the loving Mr. Spooky out for snacks and treats. Mwahahahahaha! And now, for some videos to kick-start the celebrations! Thanks to everyone that has sent me birthday wishes through Facebook and Twitter! You seriously made my day that much more special! Happy Birthday to you!!! Oh and I am jealous of your Lush trip....one of my absolute favorite stores!!! Echoing the choir here, but happy birthday!! !